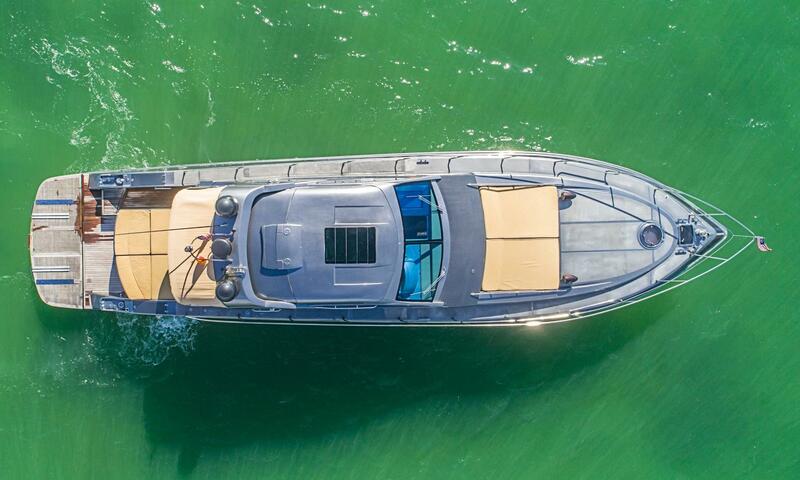 June 2018 Yard Period - New Bottom Paint, Zincs, Prop Speed, and Teak treatment. 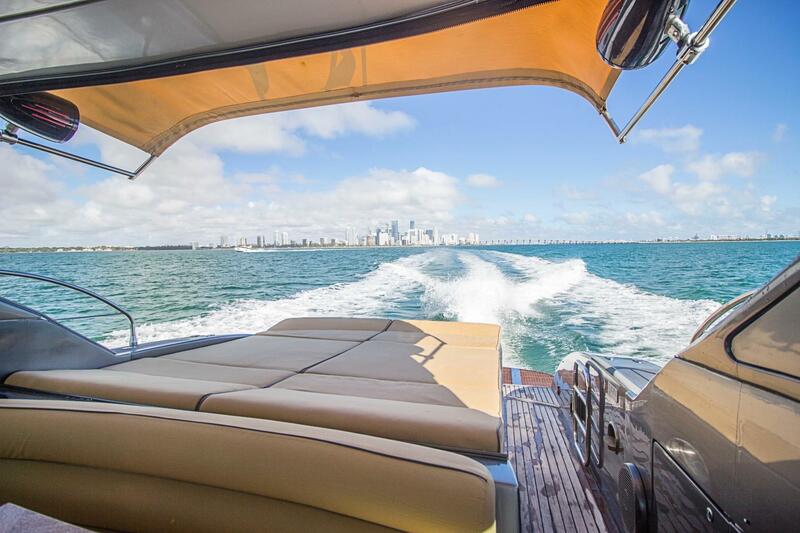 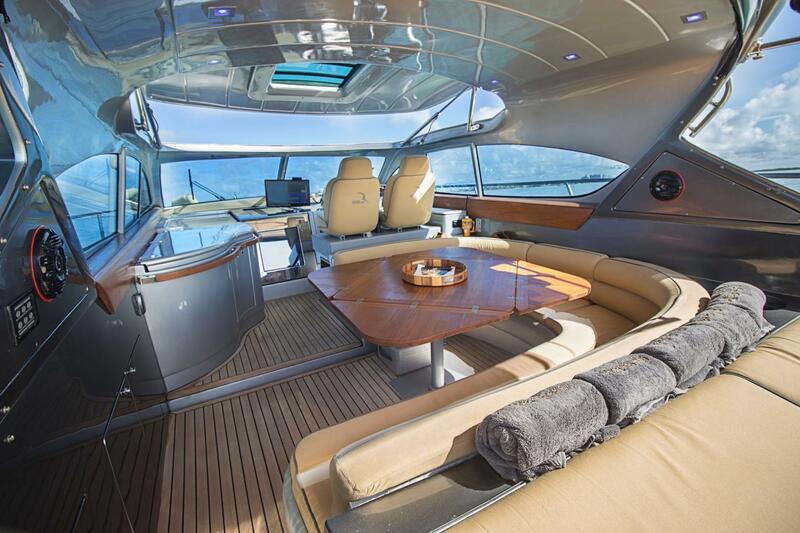 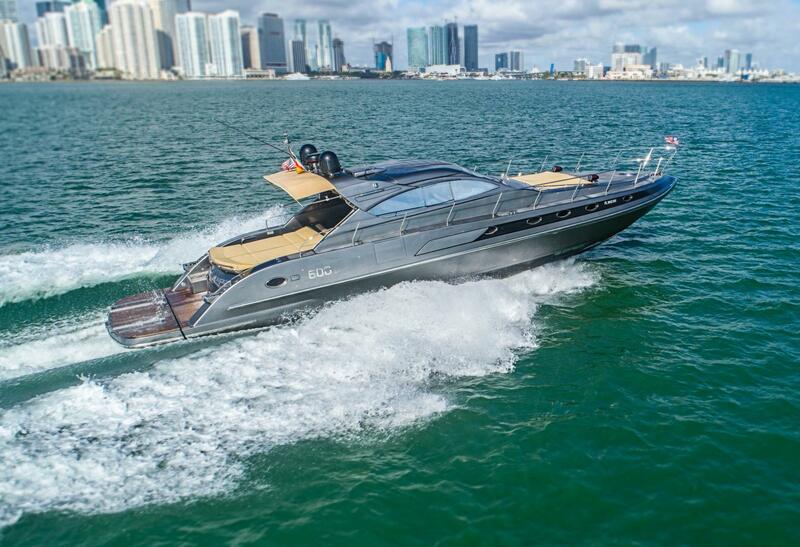 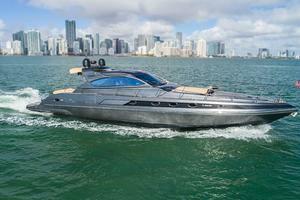 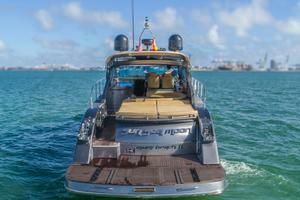 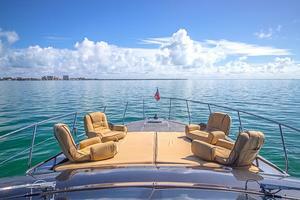 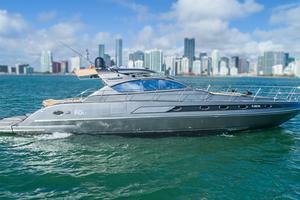 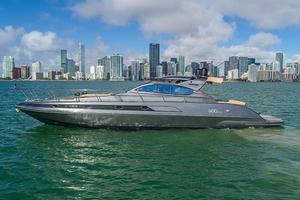 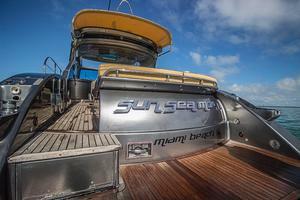 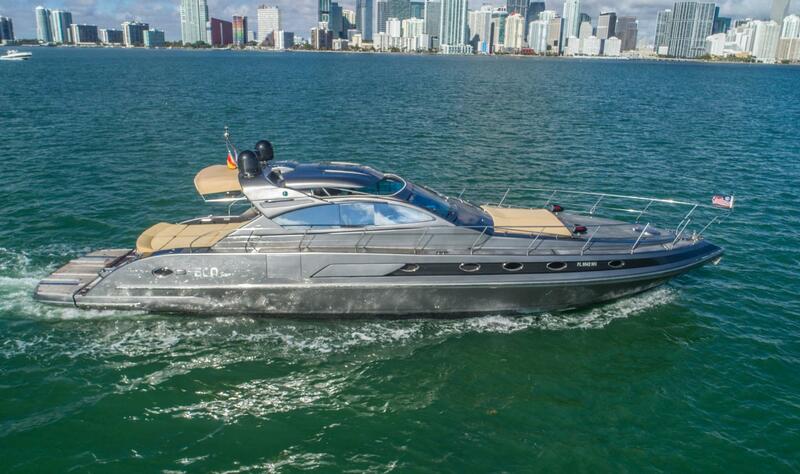 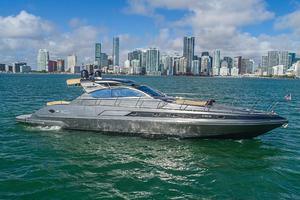 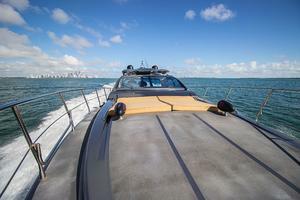 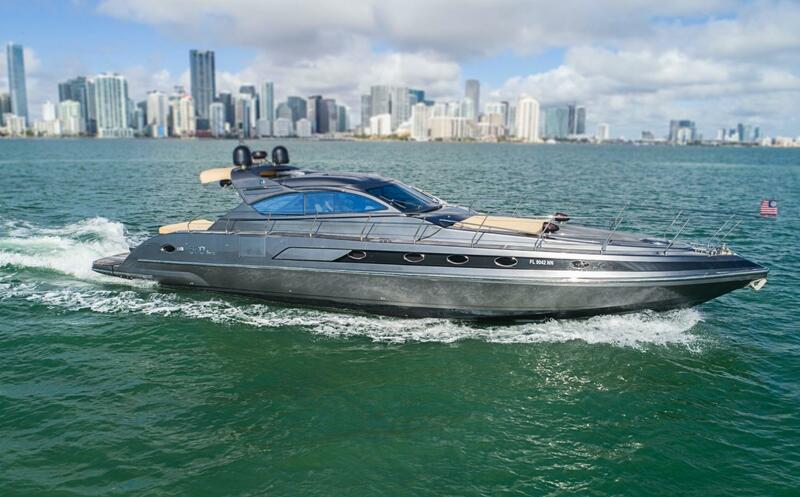 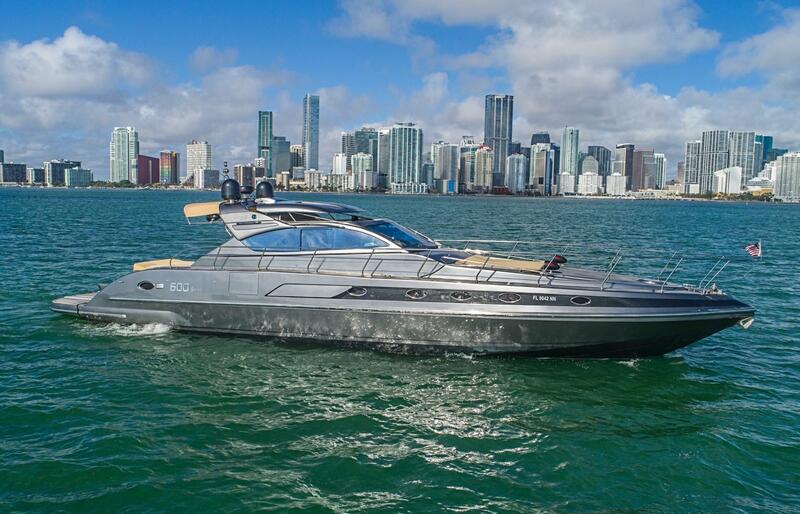 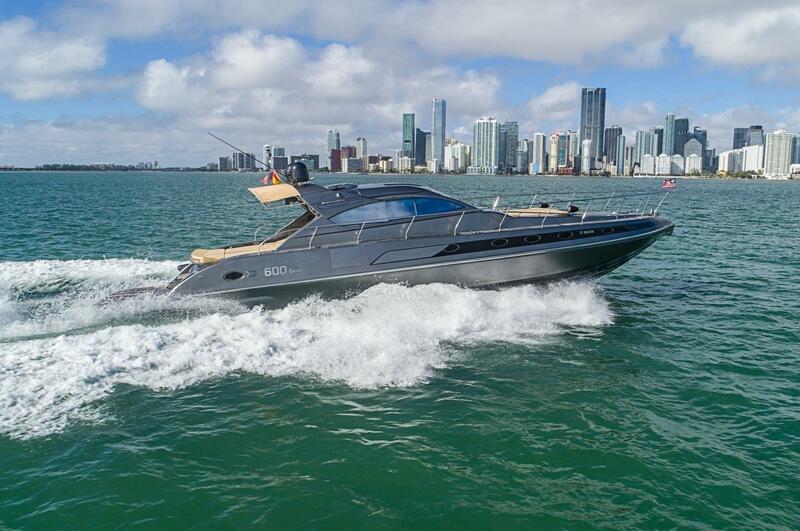 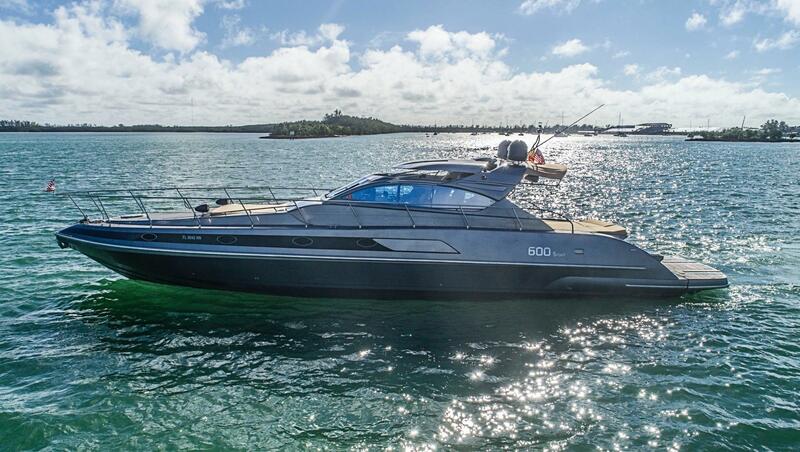 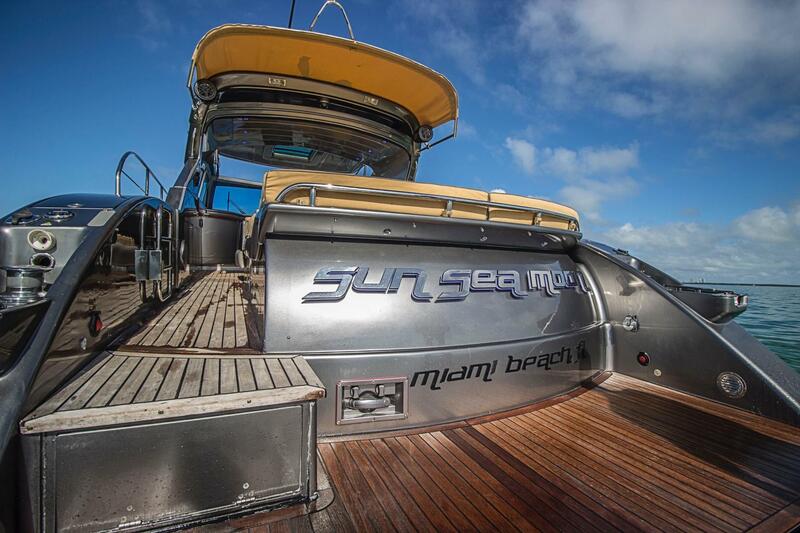 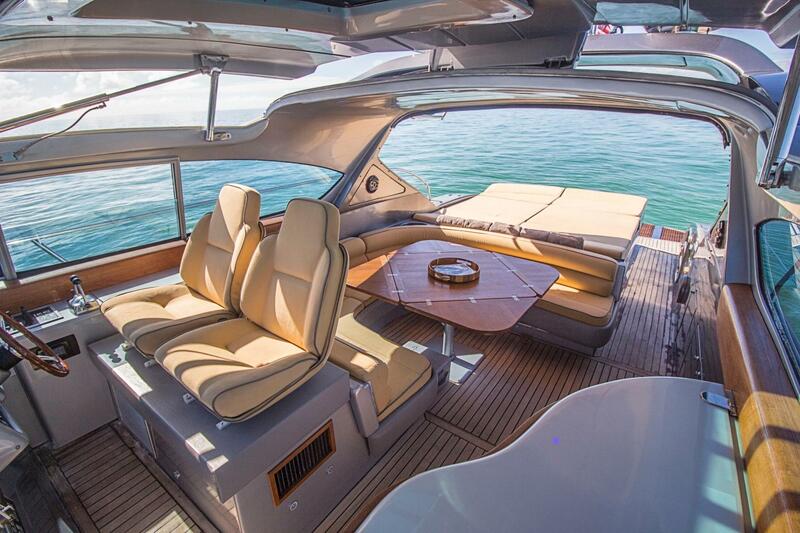 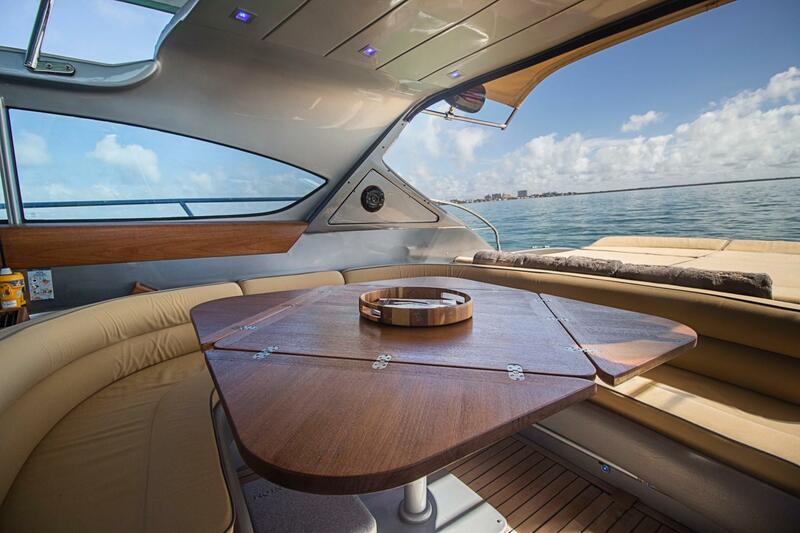 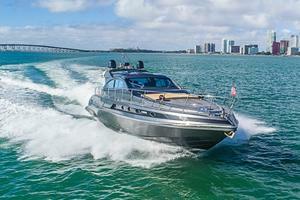 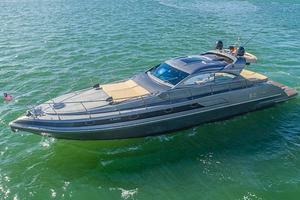 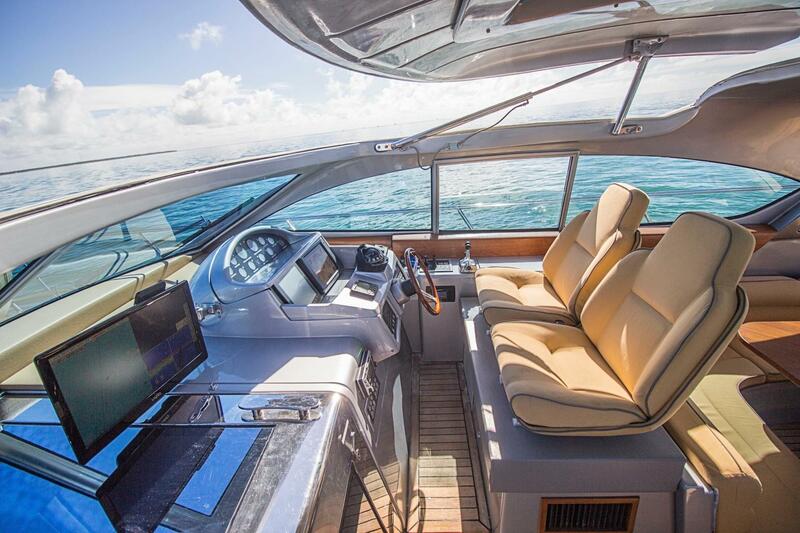 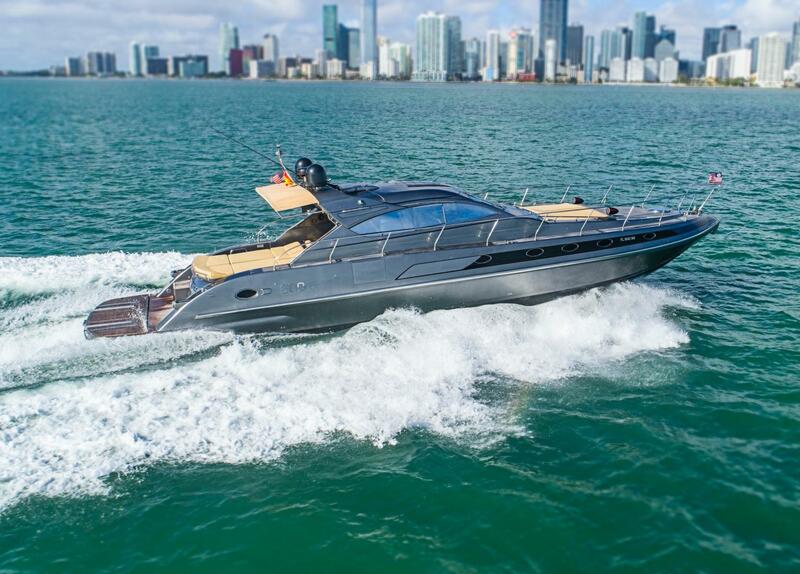 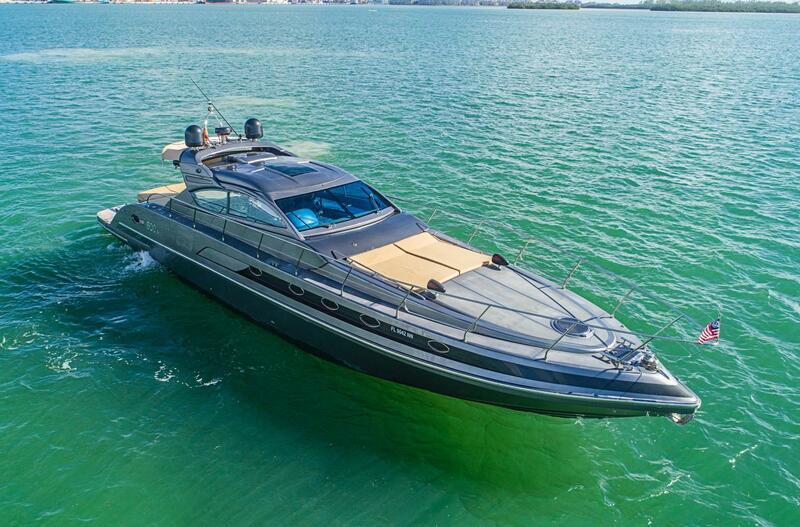 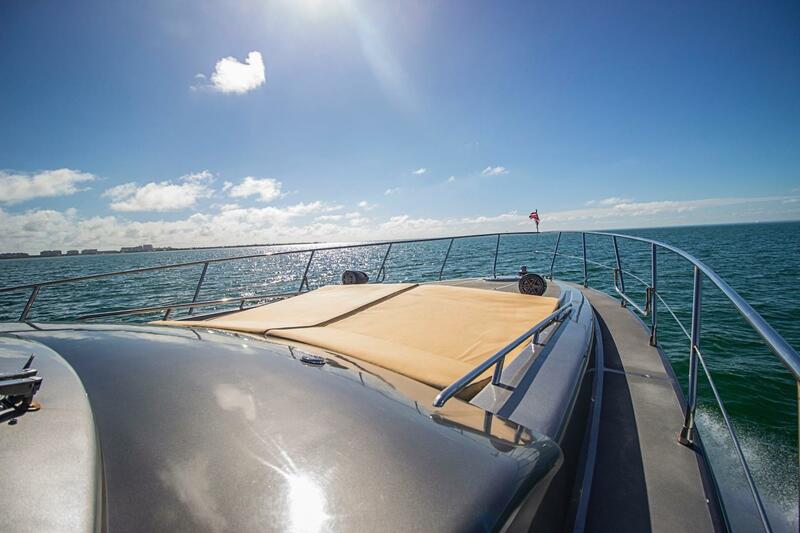 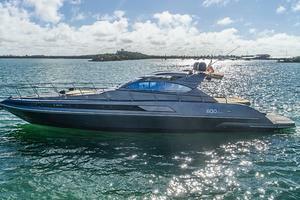 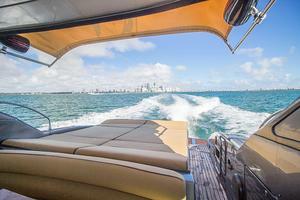 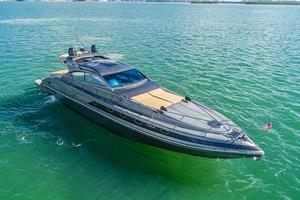 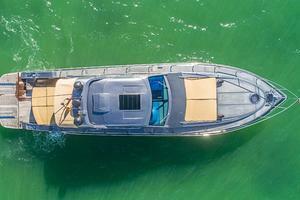 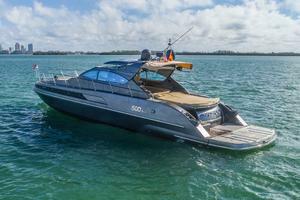 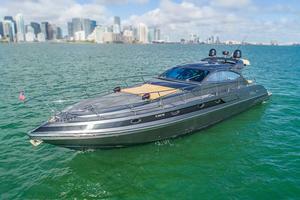 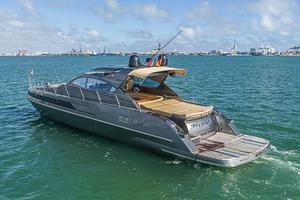 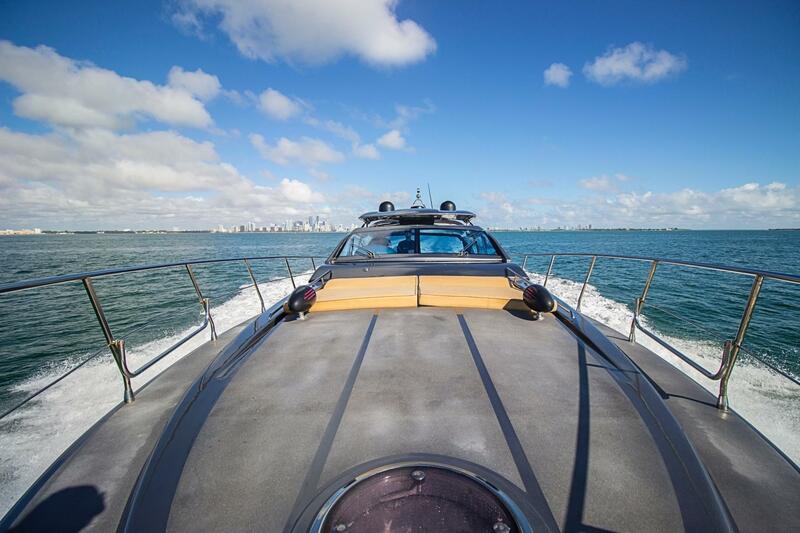 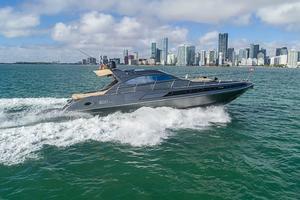 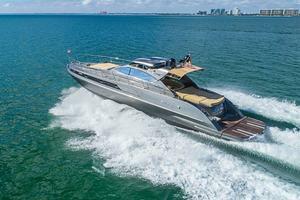 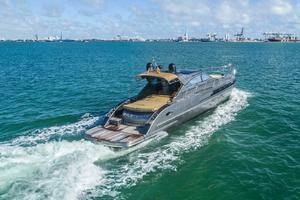 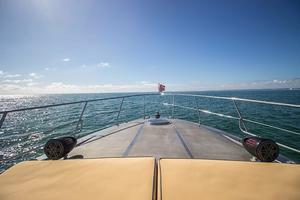 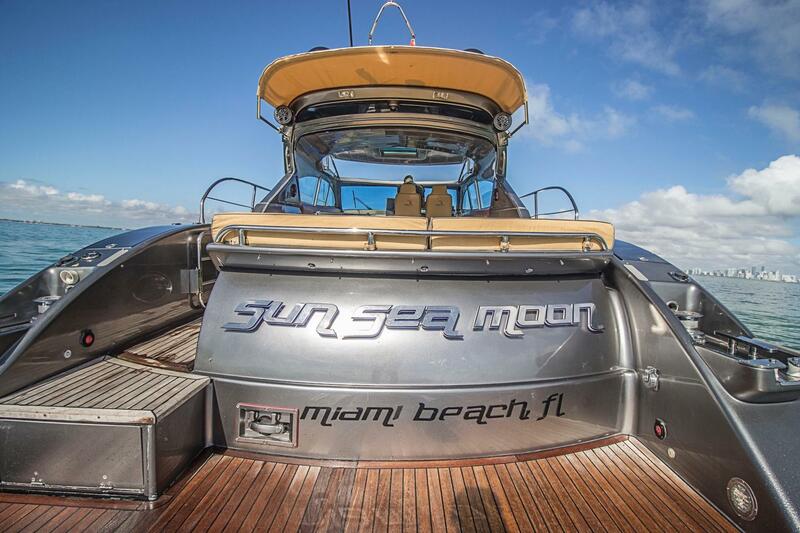 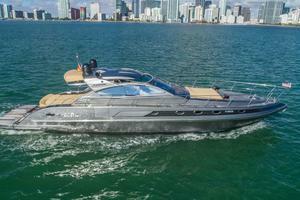 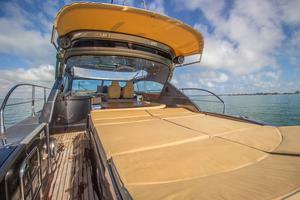 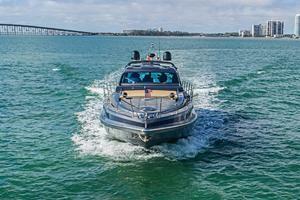 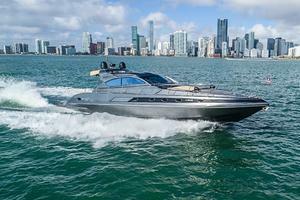 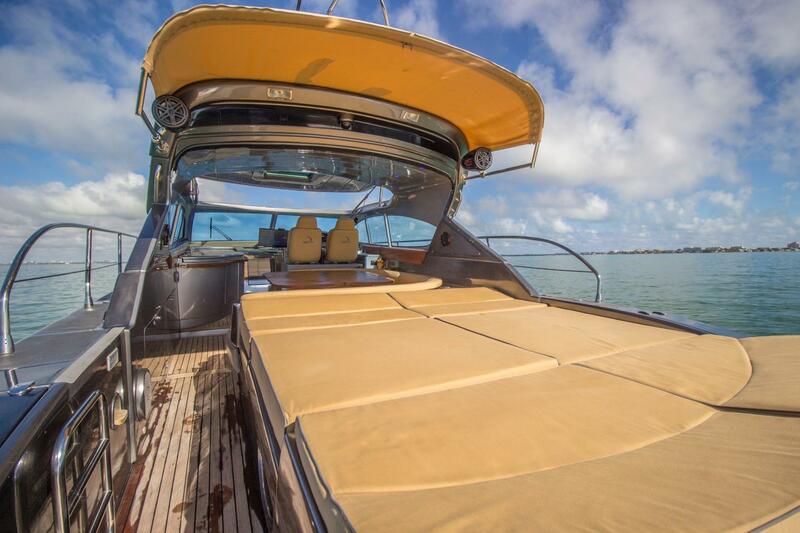 "Sun Sea Moon" is the perfect Florida weekend sport yacht. 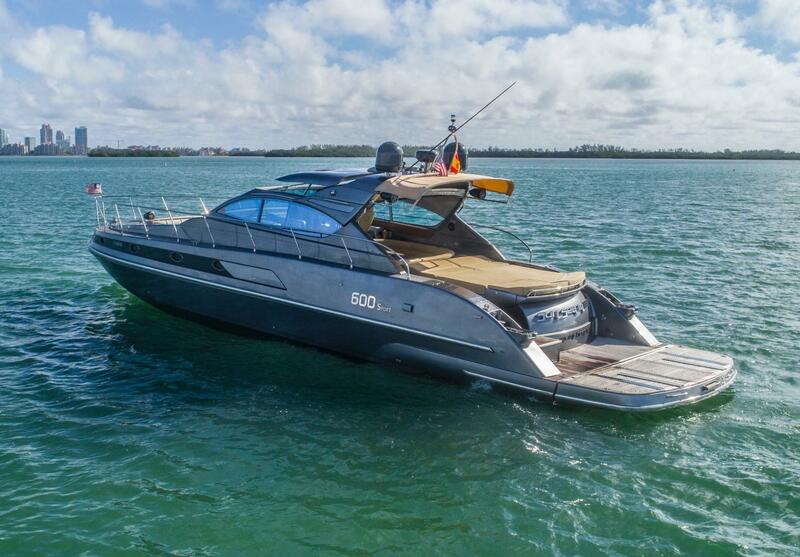 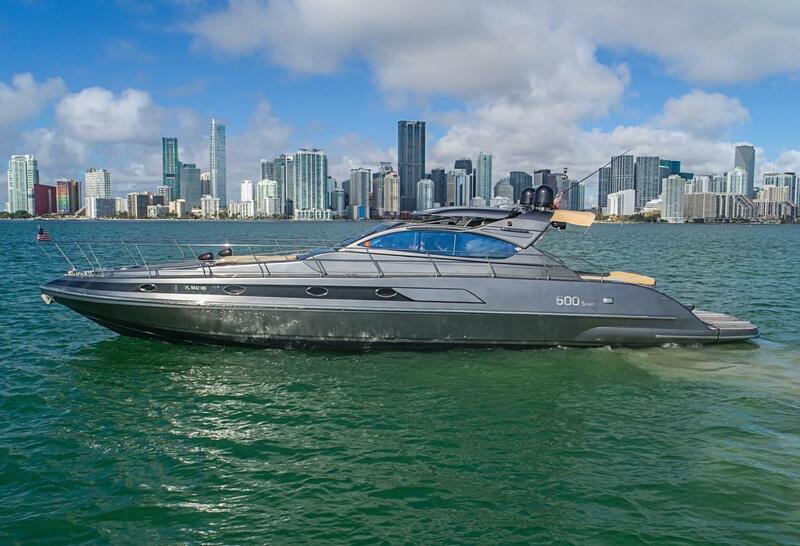 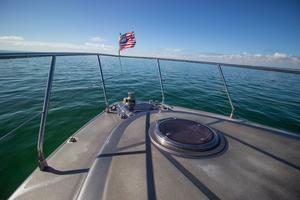 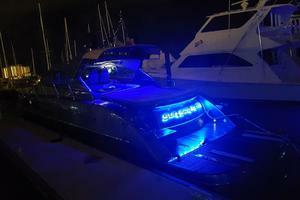 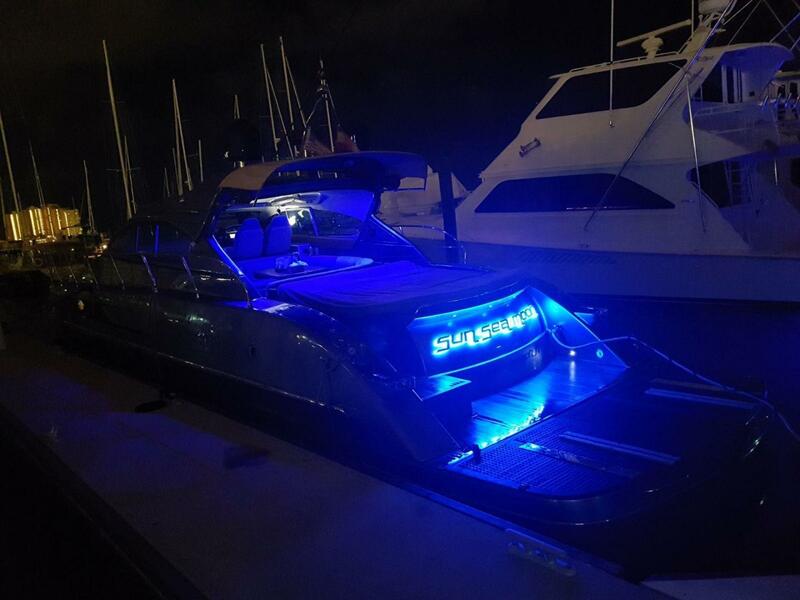 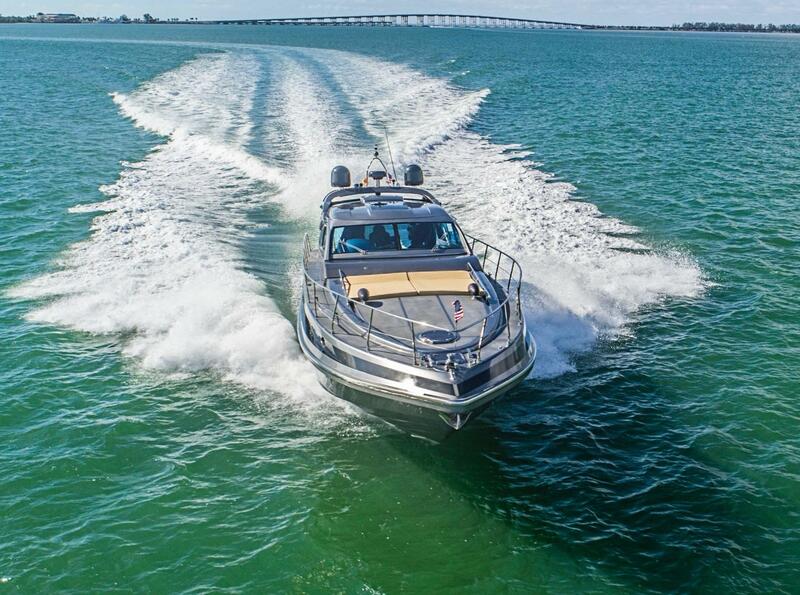 Shes Florida registered, maintained by a full time captain, has just over 1000 original hours on 765hp Volvos just serviced, and features highly desirable upgrades from a 2015 refit like new Grey Metallic Paint, New 15kw generator, tan cushions, Garmin GPS, a powerful JL Audio Sound System, and underwater lights. 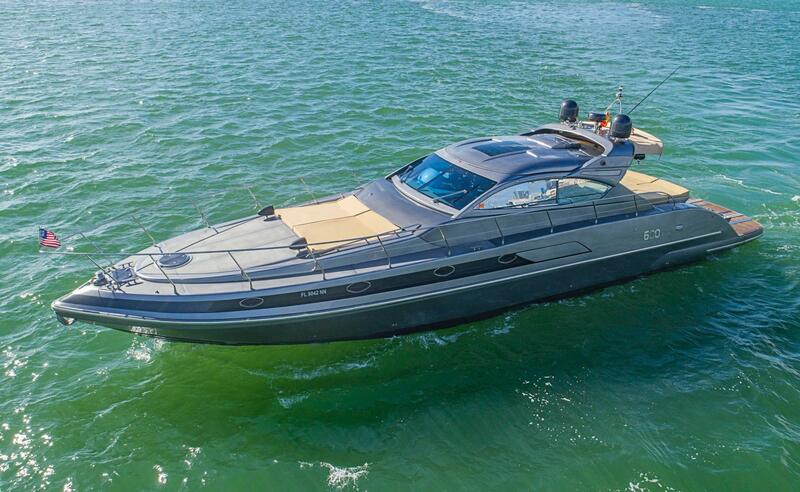 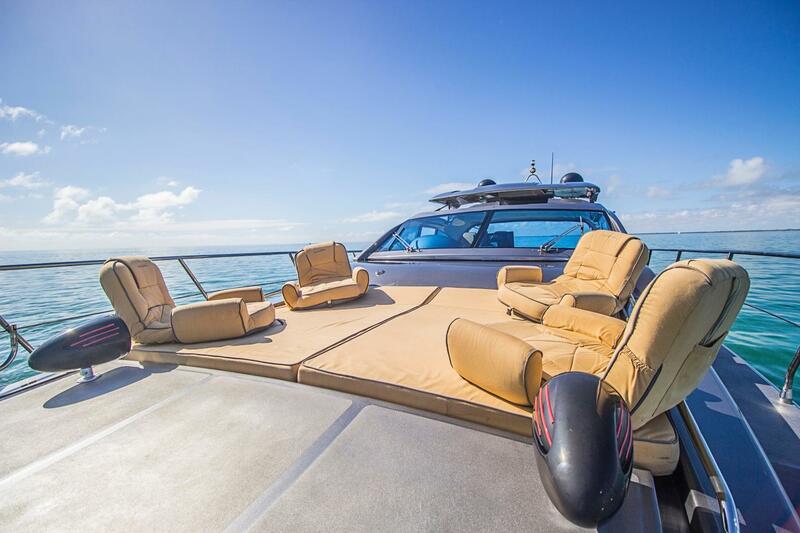 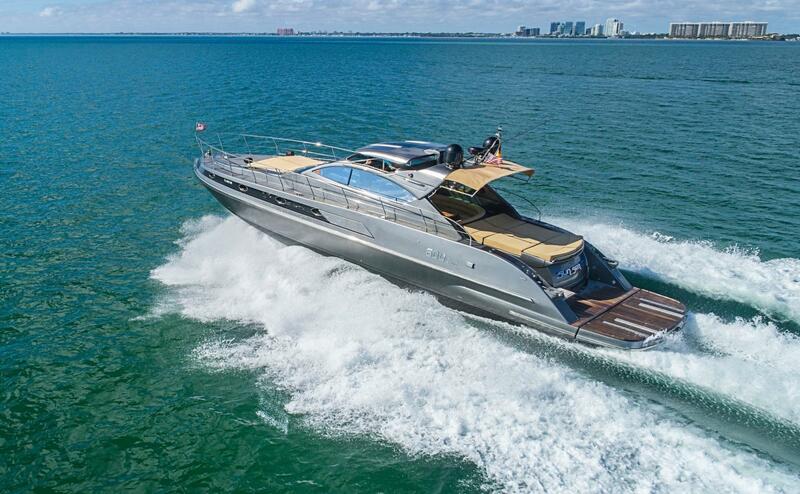 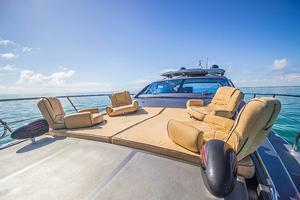 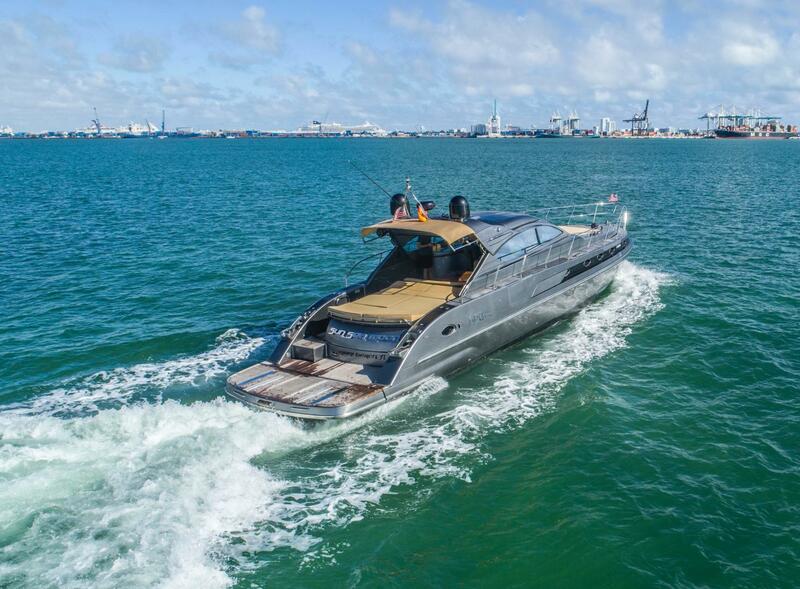 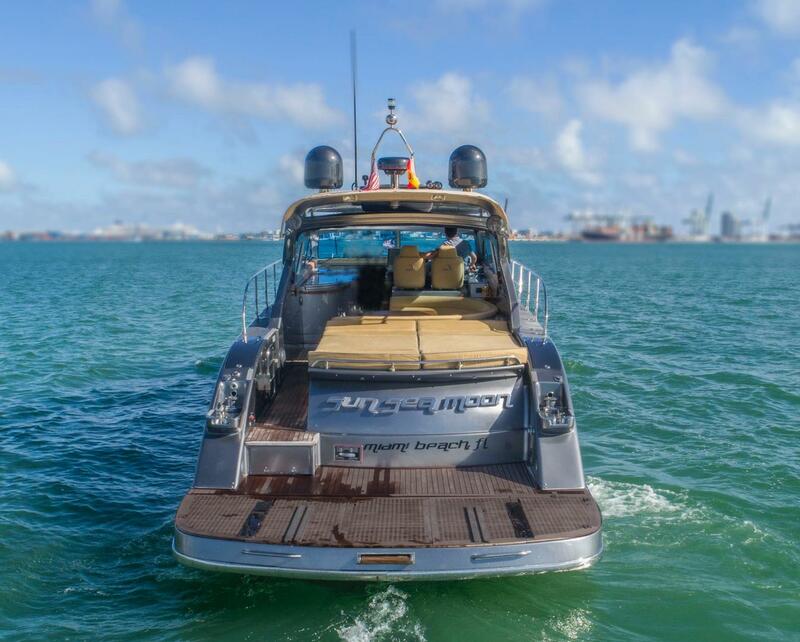 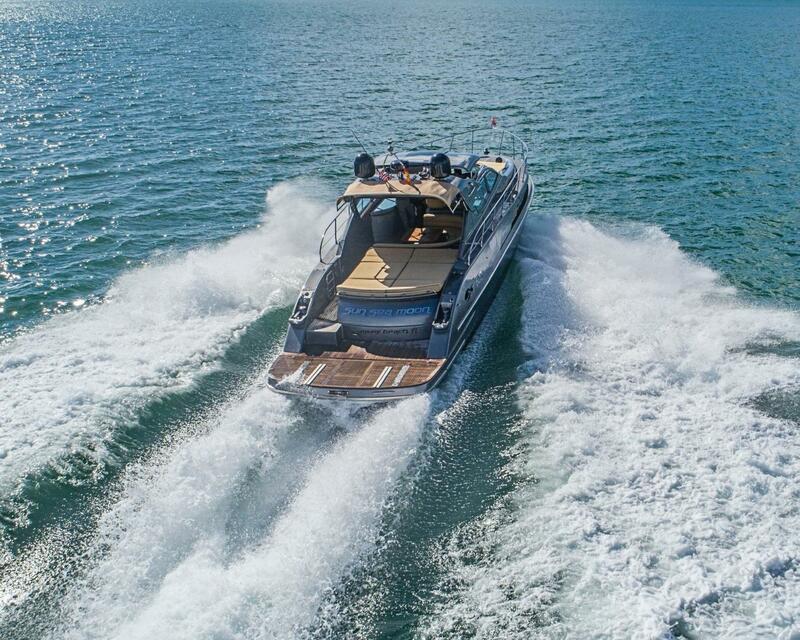 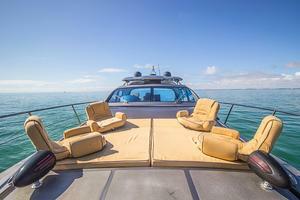 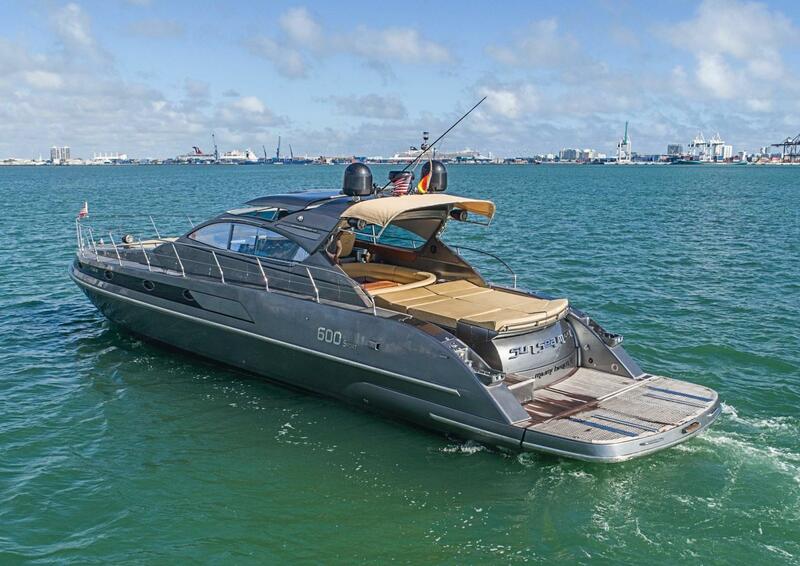 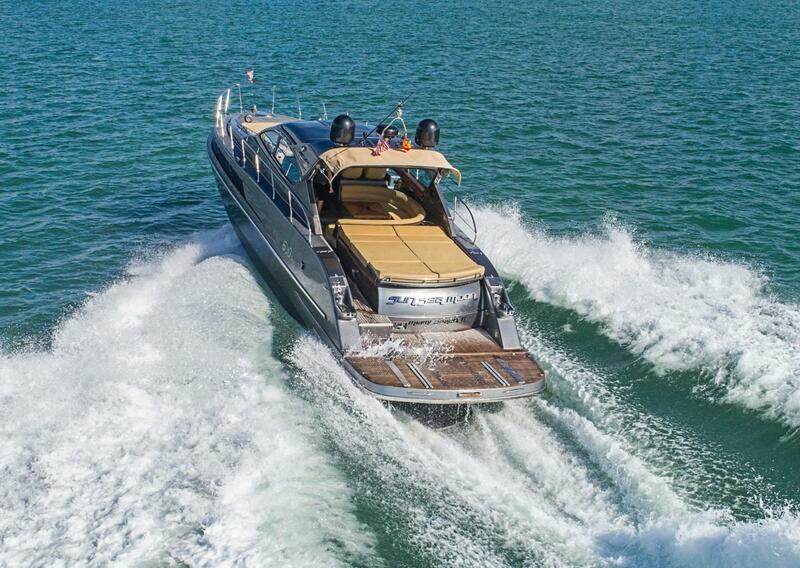 The yacht is also equipped with Bow and Stern Thruster, high capacity Hydraulic platform, and a surprisingly spacious 3 Stateroom layout with lower lounge plus Crew. 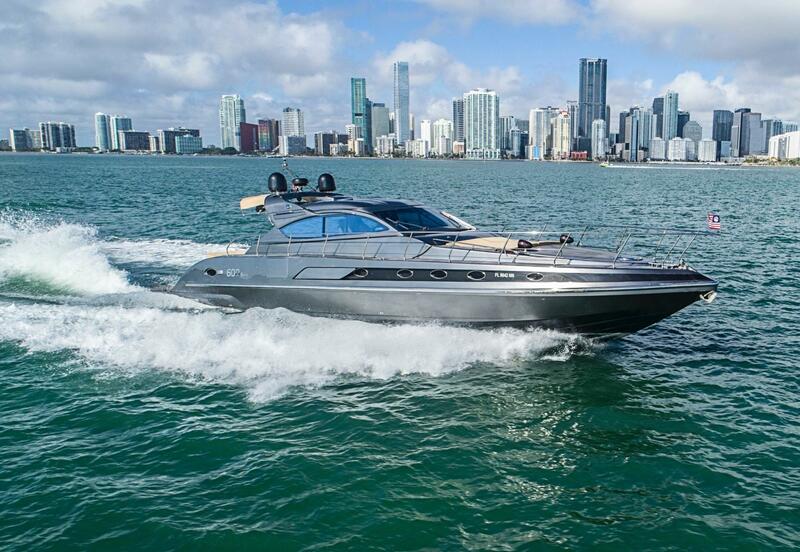 Available to view by appointment in Miami, FL. 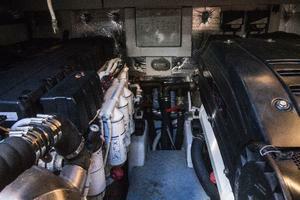 MACHINERY Engine(s), Mfg: (2)Volvo Penta No.Cyl: 6 Fuel: Diesel Model: D12-D MP 1. (p) 1012609048 (s) 1012609047 Rated H.P: 765 each @ 2300 rpm Hours: 1000 (Service complete) Cooling System Type: Fresh water cooled with heat exchanger and raw water cooled Transmissions: ZF 3251A, ratio: 1.733 to 1. 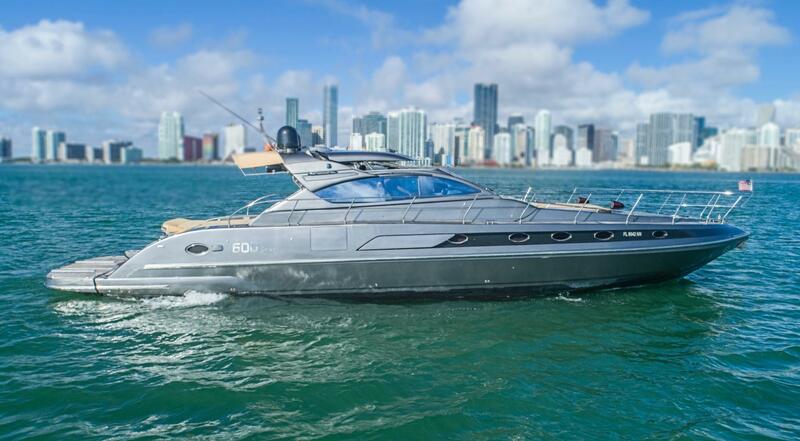 SN: (p) 20084928 (s) 20084924 Motor Mounts: Through bolted to longitudinal stringers Exhaust System Type: Wettype Stuffing Boxes: Dripless type Controls: Electronic Steering System: Hydraulic GENERATOR Mfg/model: Kohler 15EOZD Rating: 15kw Fuel: Diesel SN: SGM324RXP Hours: 1000 Year: 2015 Cooling System: Fresh water cooled with heat exchanger and raw water cooled exhaust FUEL TANKS Fuel Tanks: (2) Fiberglass, located outboard of the engines. 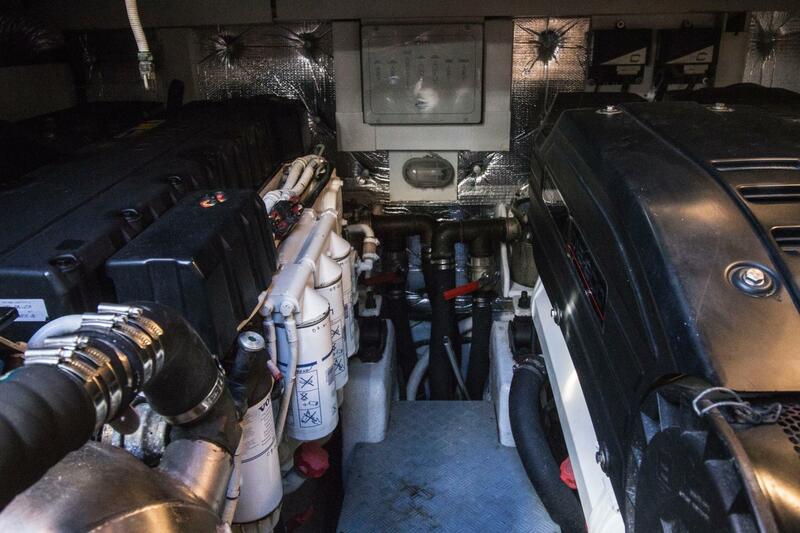 Fuel Fill Location: Side deck. Fuel Level Gauge: Located at the helm Fuel Lines, Material: Approved hose Fuel Filter, Primary: Racor fuel/water separators Potable Water System Water Tank: (1) Polyethylene, located below deck Fill Location: Side deck Pressure Pump: AC & DC powered pumps Water Lines: PVC Water Heater: AC powered approx. 15 gallons Waste Water System Holding Tank: (1) Polyethylene, located below deck Pump Out Location: Side deck Waste Discharge Pump: 24vdc Heads: (3) Teema Marine Gray Water Sumps: (1) with DC powered pump Electrical System, DC Nominal Voltage: 12/24vdc. 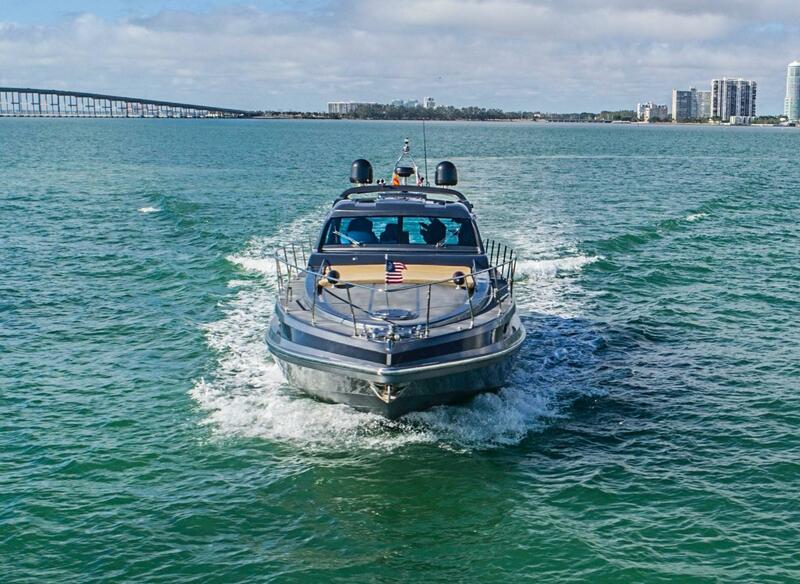 Batteries: (4) 12 volt wet cell, located aft in the engine room Secured: Yes Covered: Yes Battery Charger: Dolphin 24 volt Panel Location: Crew quarters, all breakers are labeled Meters:Volt Circuit Protection: Breakers & fuses, all circuits have overload protection. 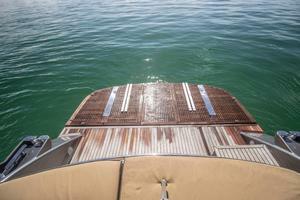 Wiring: Thermoplastic, marine grade, properly routed and secured. 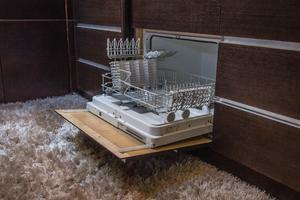 Electrical System, AC Nominal Voltage: 120/240vac , 60hz. 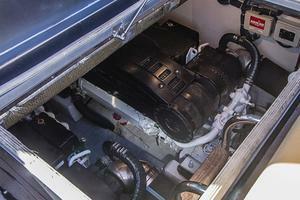 Shore Power: 120/240vac 50amp, transom. 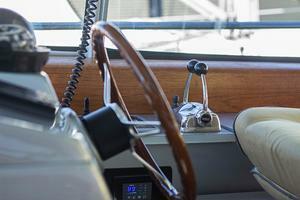 Polarity: Indicator on panel. 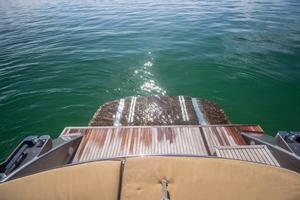 Inverters: (2) Pure Sine, located in the lazarette. Panel Location: Crew quarters, all breakers are labeled Meters:Volt Circuit Protection: Breakers & fuses, all circuits have overload protection. Wiring: Thermoplastic, marine grade, properly routed and secured. 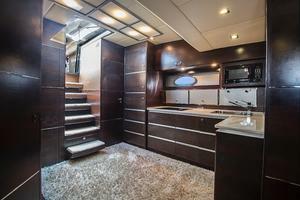 INTERIOR - MAIN DECK The galley is along the port side. 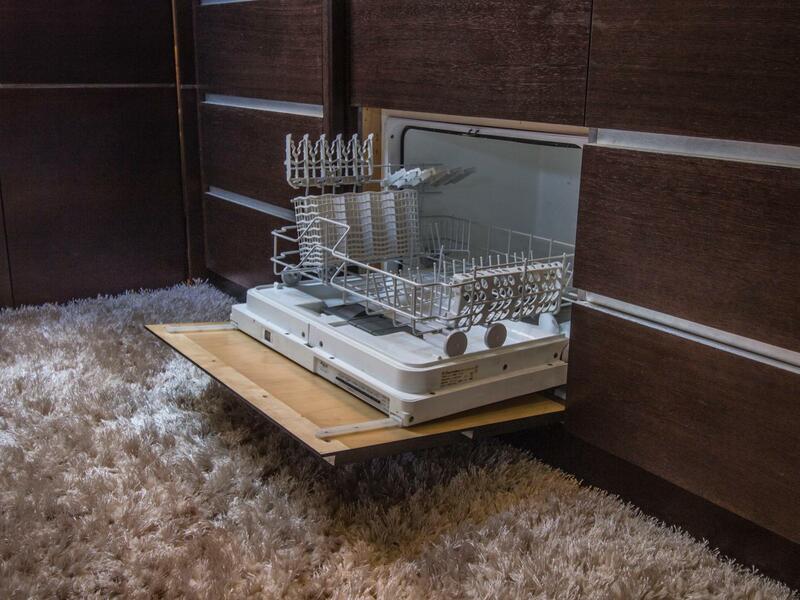 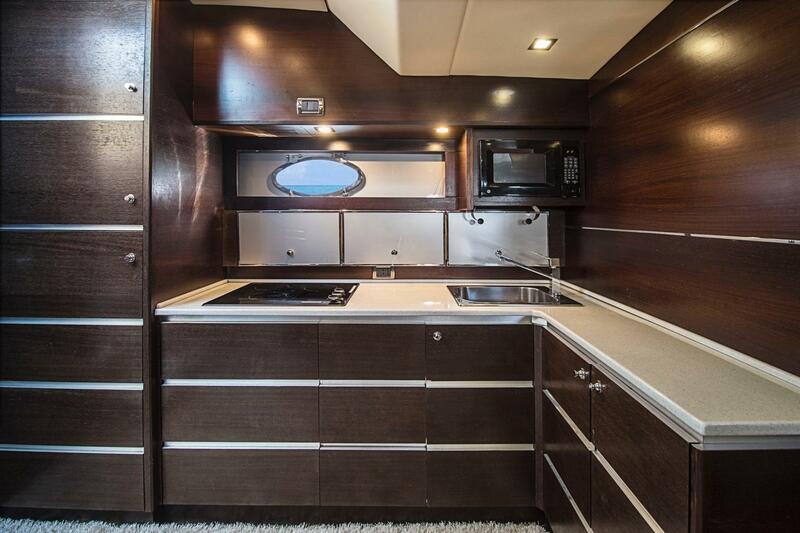 It has wood cabinetry, electric stove top, microwave, and refrigerator/ freezer. 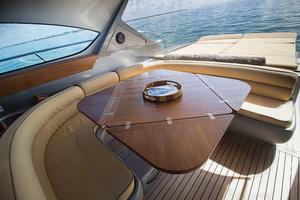 To starboard is a U-shaped settee with storage below. 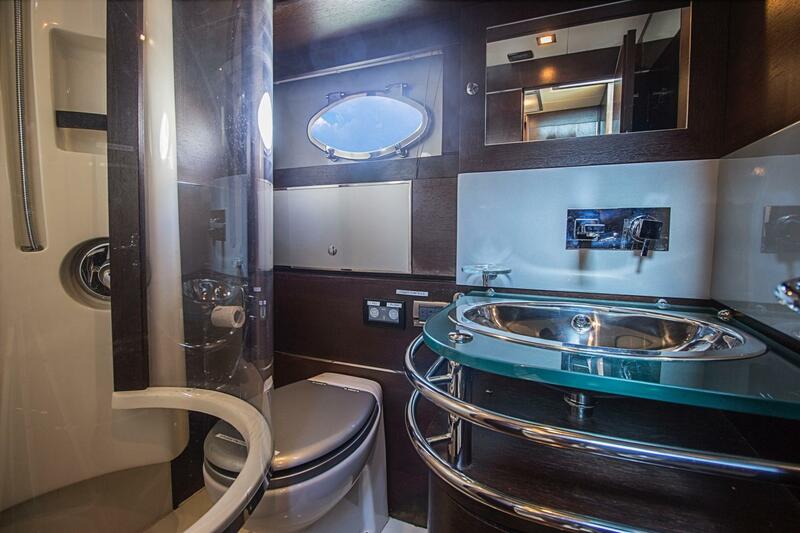 The guest head is also to starboard with electric head, sink, and stall shower. 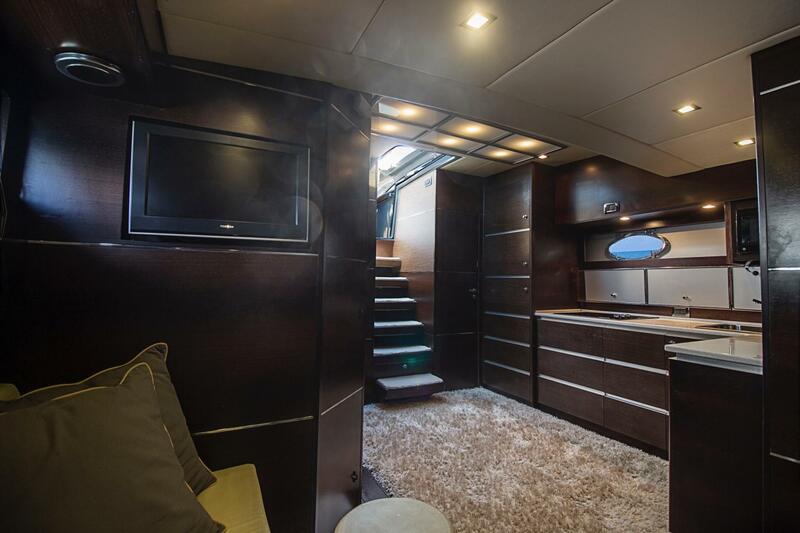 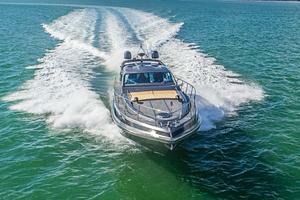 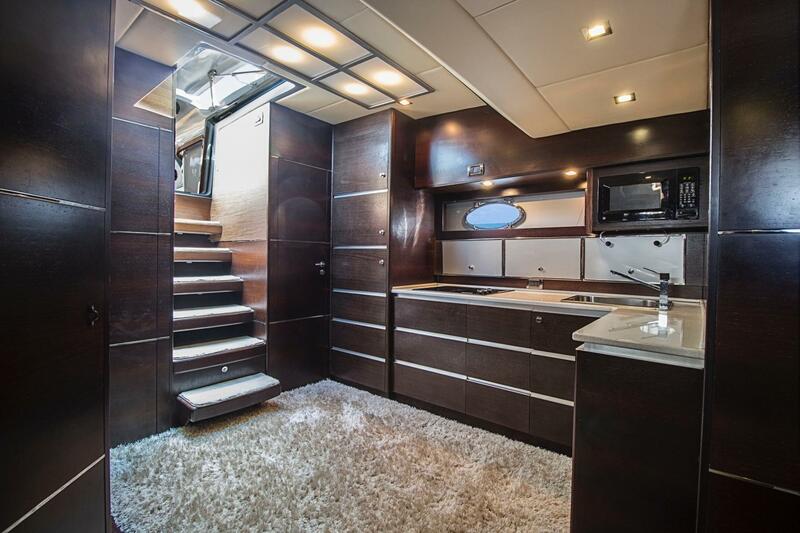 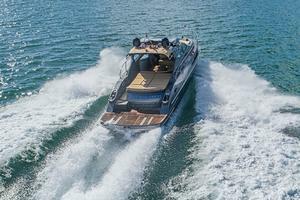 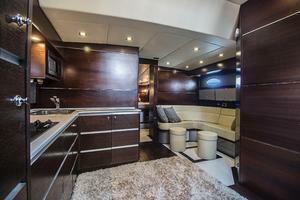 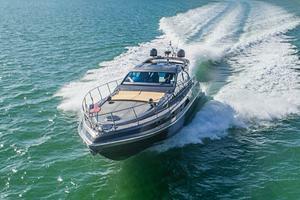 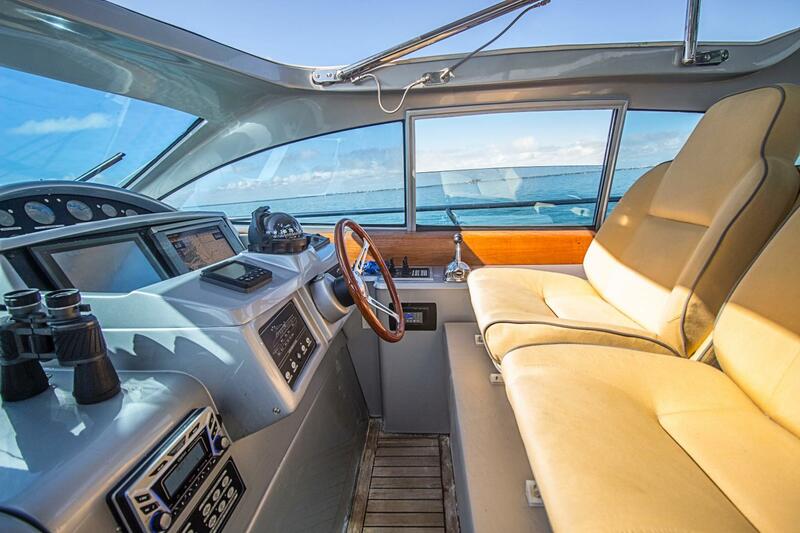 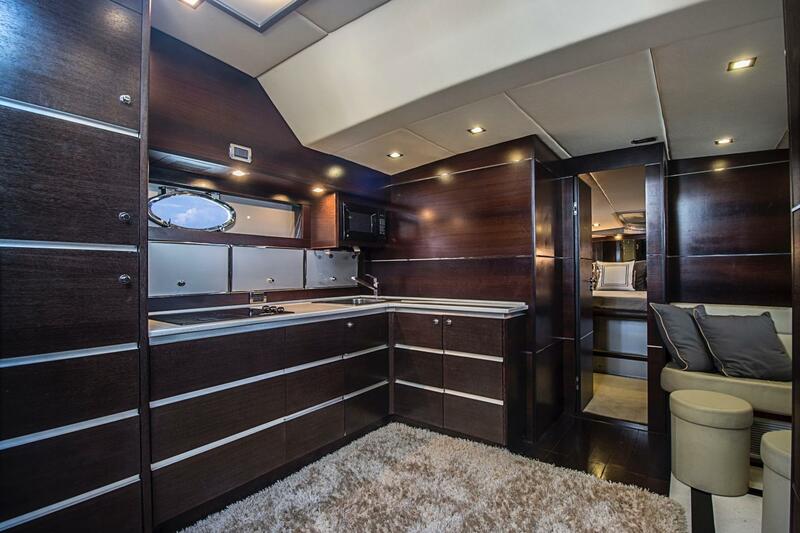 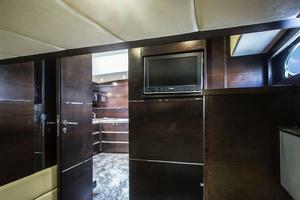 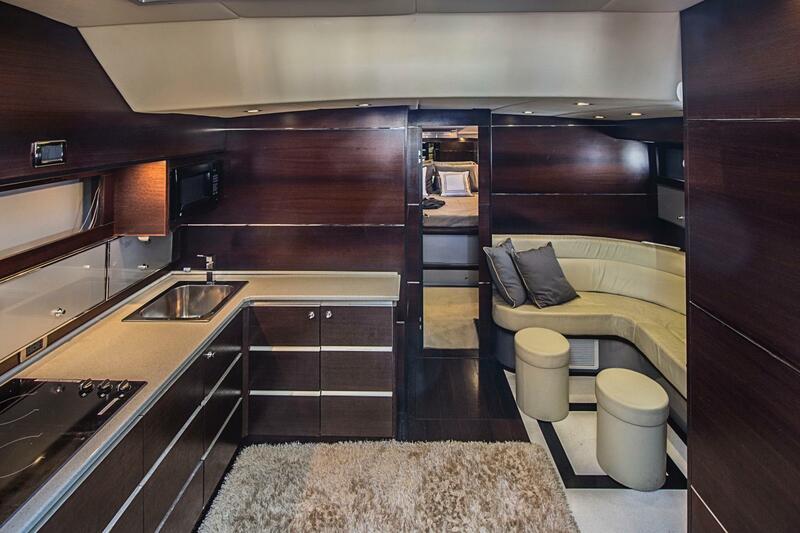 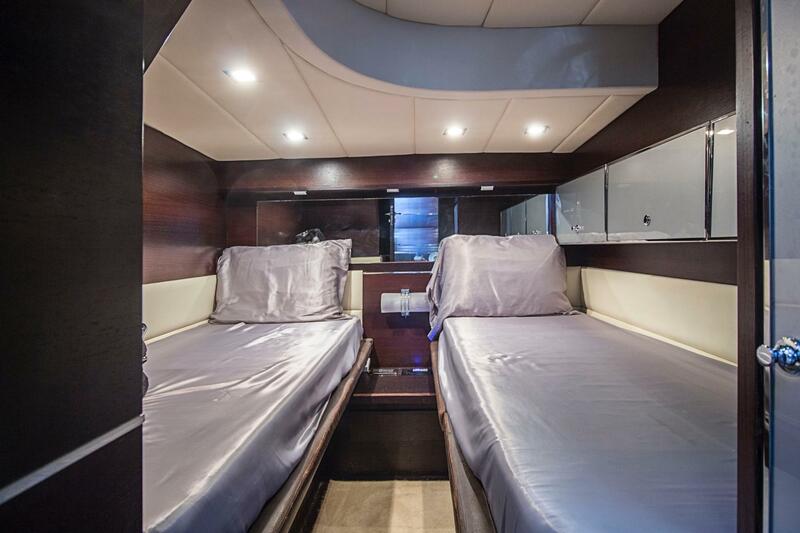 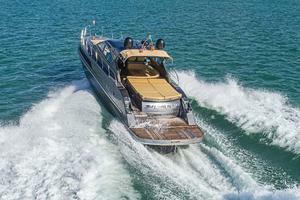 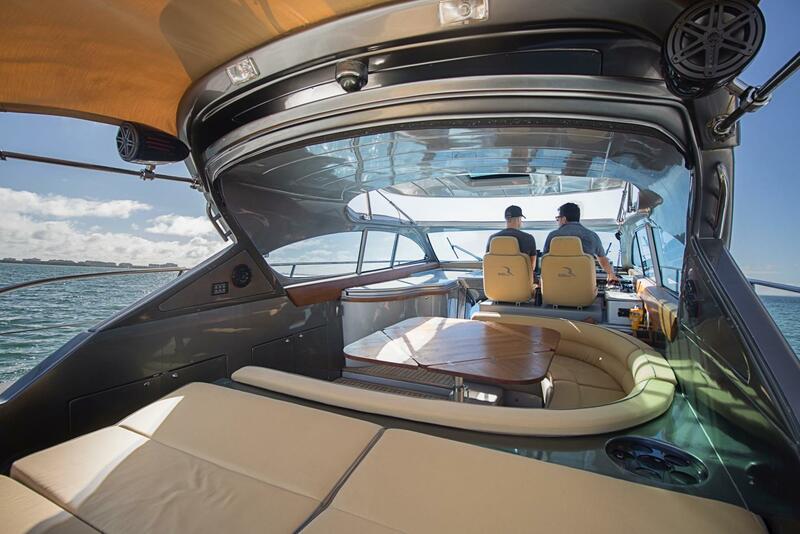 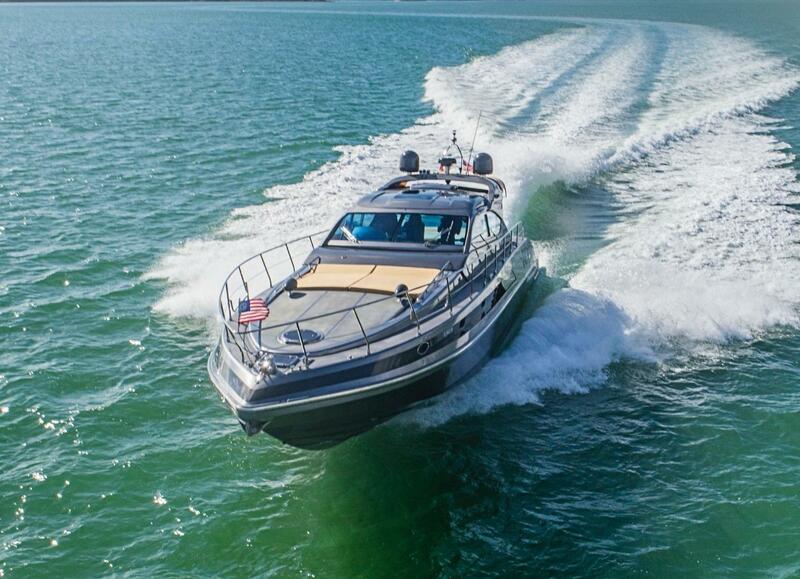 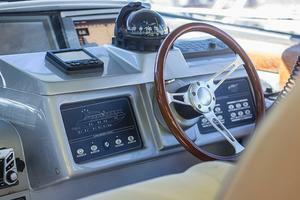 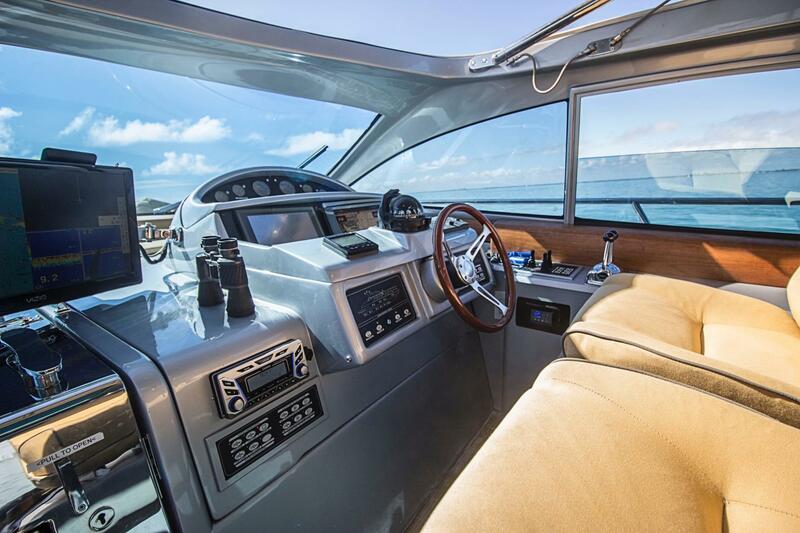 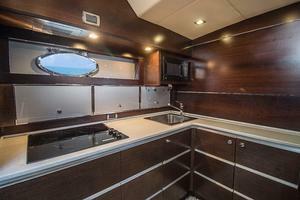 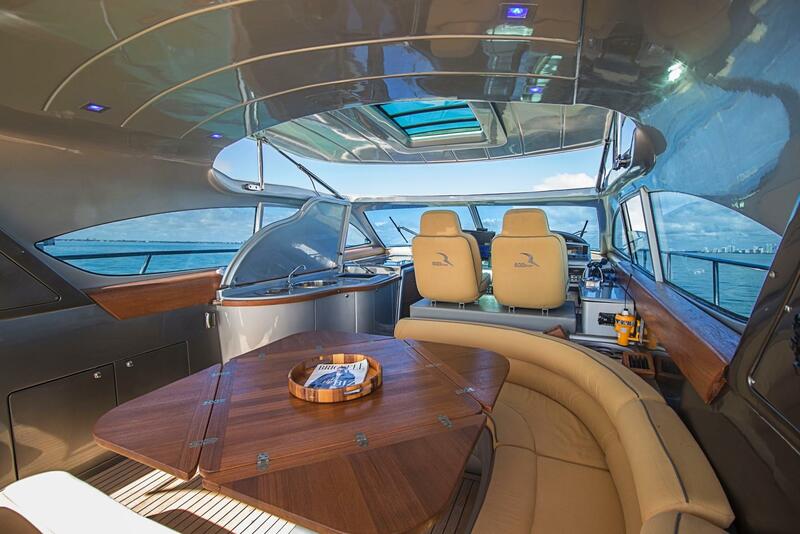 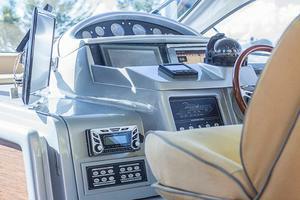 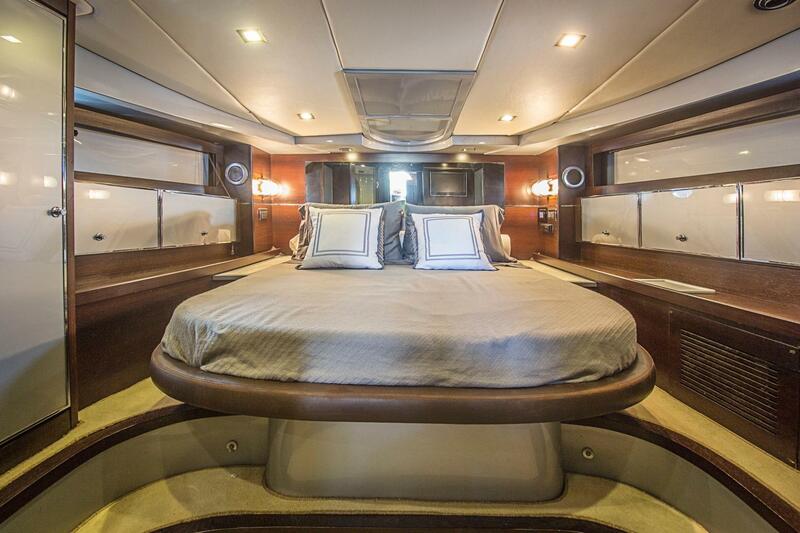 The master cabin is forward with island berth, hanging lockers, and built-in storage. 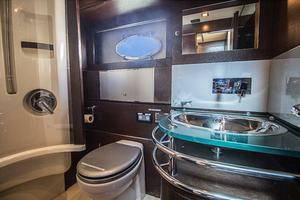 There is a Toshiba flat panel television in the cabin. 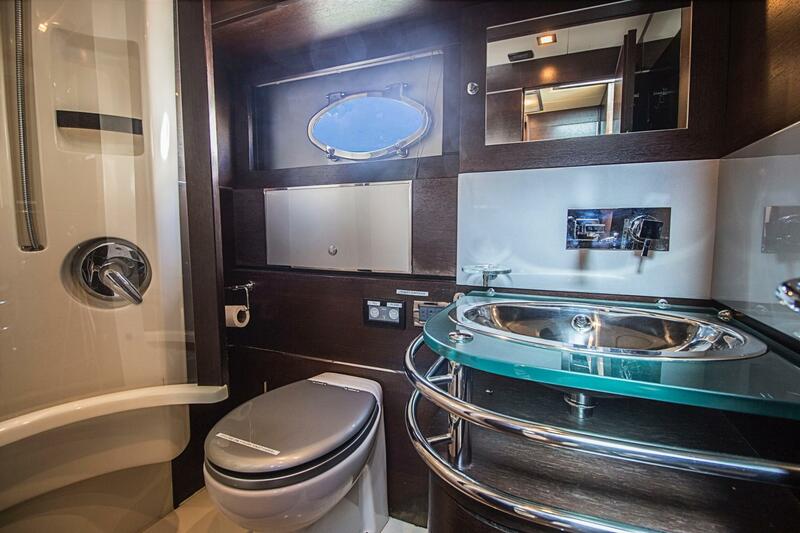 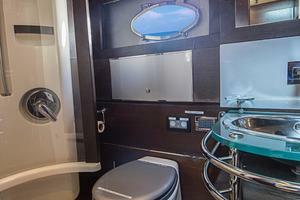 The cabin has an en-suite head with electric head, sink, and stall shower. 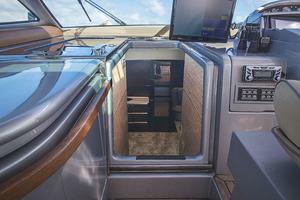 Going aft from the main cabin she has guest cabins port and starboard. 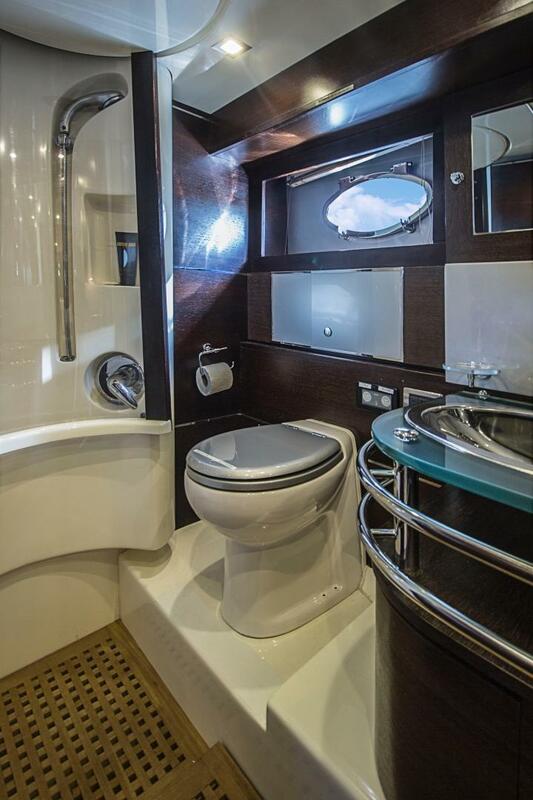 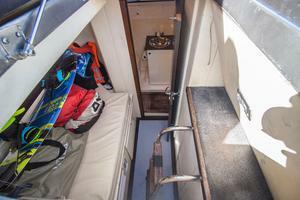 The starboard cabin has double berth, hanging locker and drawer storage. 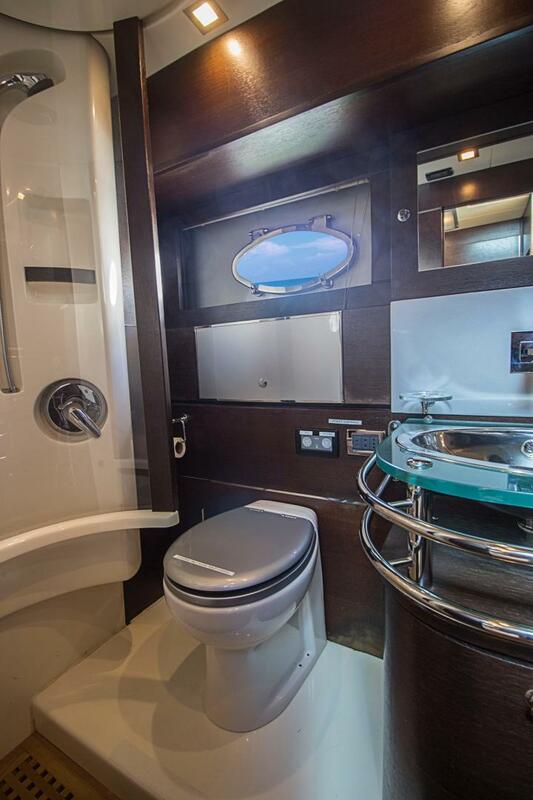 There is a Toshiba flat panel television in the cabin. 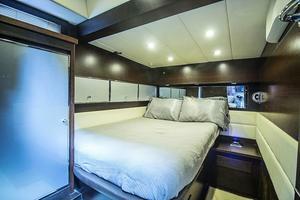 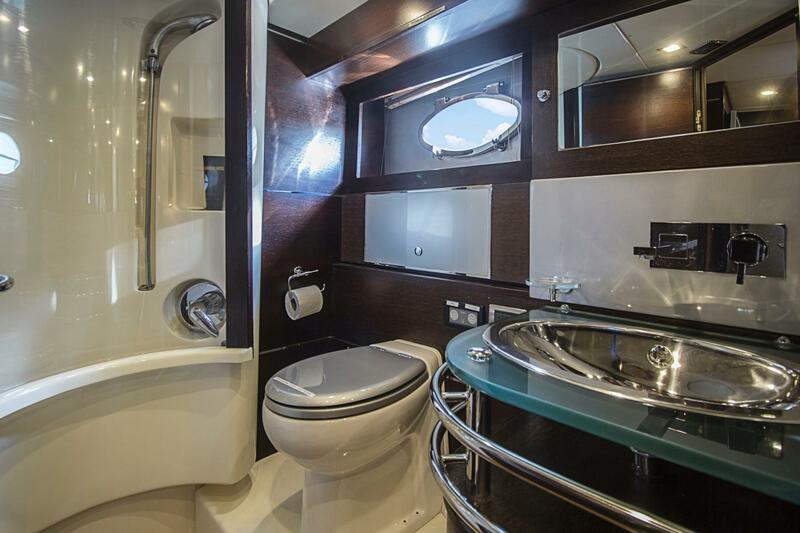 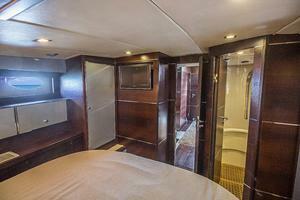 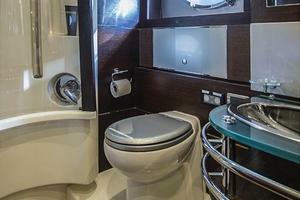 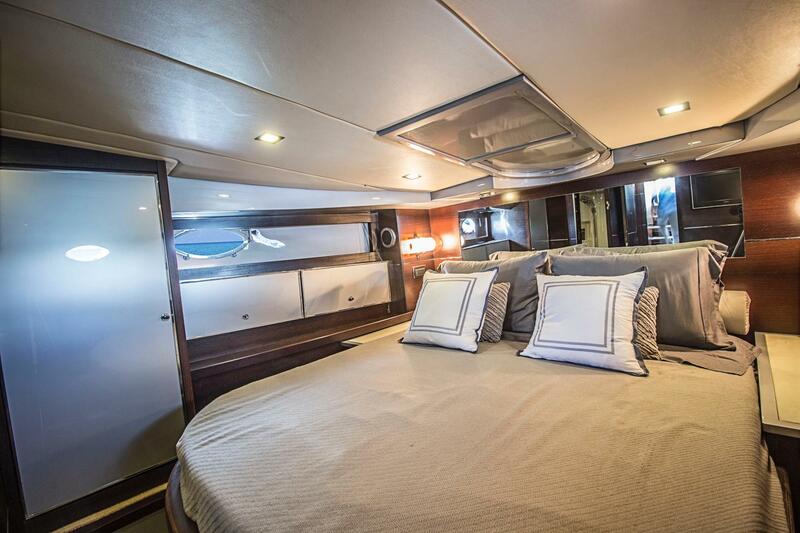 The port side guest cabin has twin single berths, hanging locker and drawer storage. MAIN DECK The helm is to starboard. 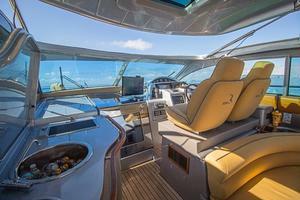 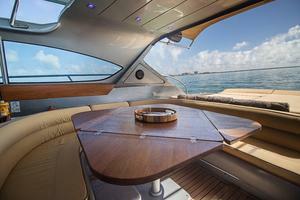 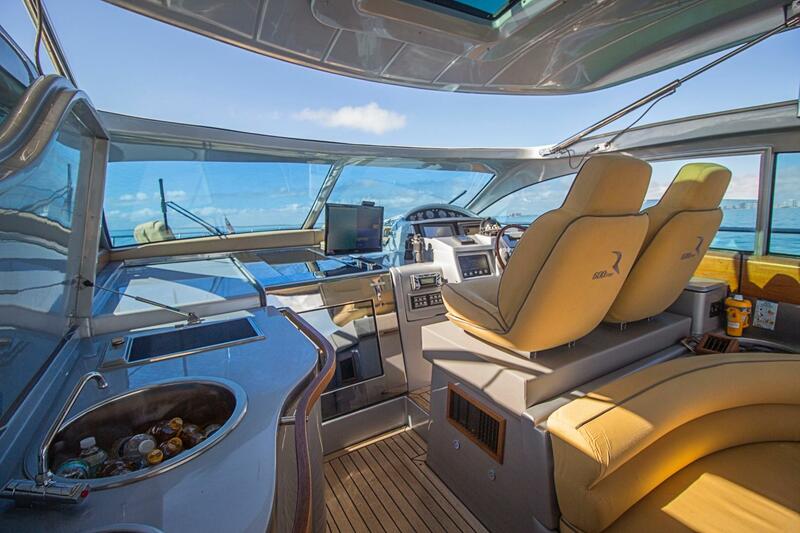 There are two pedestal seats at the helm and bench seating aft. 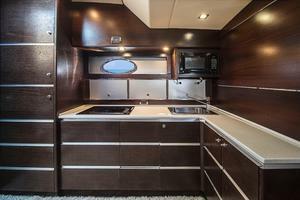 To port is a wet bar with refrigerator. 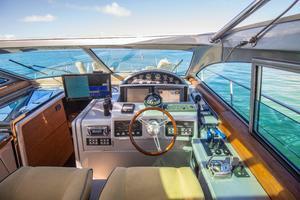 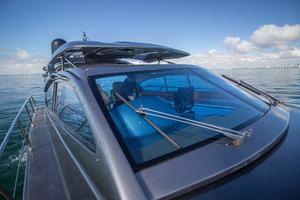 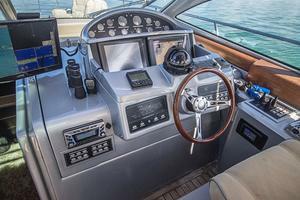 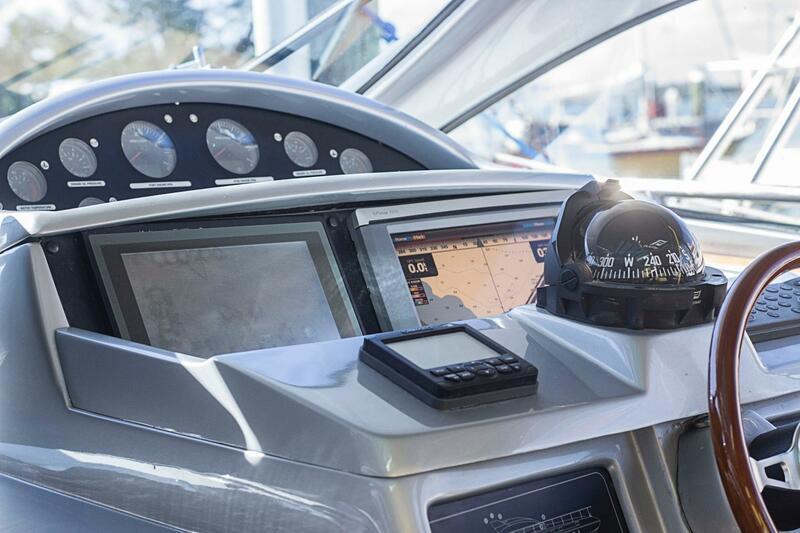 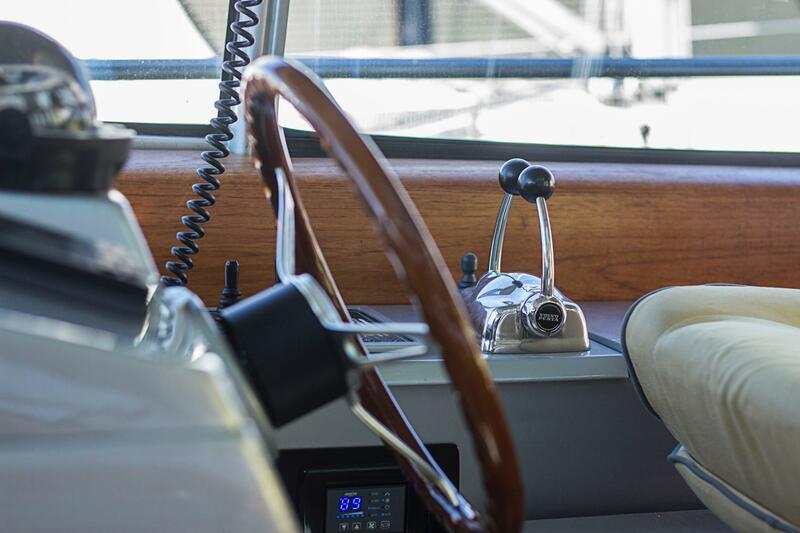 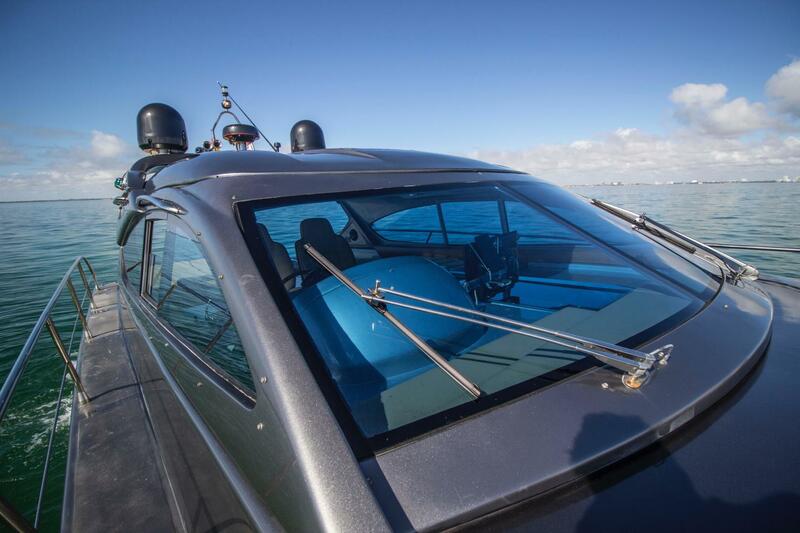 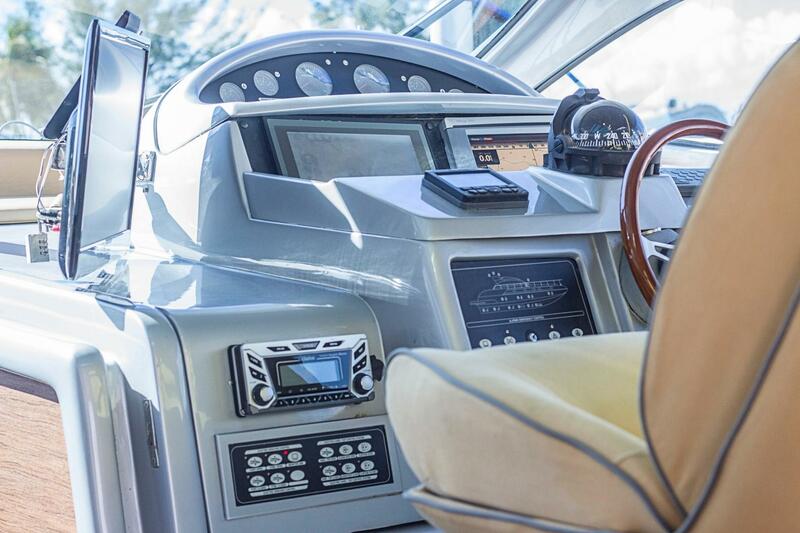 The helm area is unclosed with windows port, starboard, and forward. Aft there are isinglass curtains. She has a hydraulically operated sun roof. All the way aft there is a sun pad and hatches accessing the engine room and crews quarters.